Washington Square Arch in Manhattan’s Greenwich Village and The Soldiers' and Sailors’ Memorial Arch in Brooklyn’s Grand Army Plaza are two of the most iconic structures in all of New York City. Long gone today, however, are several archways in New York City that, while no longer extant, were meaningful to the people who built and experienced them in their time. And then, almost as quickly as these arches were built, they were gone. Leading this list of fleeting corporeality is an edifice constructed in New York City just after the Great War—the Victory Arch that stood at the intersection of Fifth Avenue and Broadway between 24th and 25th Streets from 1919–1920. Other examples of these transient edifices include the original plaster and wooden Washington Square arch hastily constructed in 1889 for the centenary of President Washington’s first inaugural. This is not to be confused with two additional albeit more modest arches built at the same time a few blocks north in Madison Square for that same centennial. A decade later, again in Madison Square, came the Dewey Arch, built in honor of the admiral who had done so much to win the war in Manila Bay during the Spanish-American War. Citizens turned out at these sites in the hundreds of thousands to honor the achievements of those for whom they were constructed and witness what they knew was history in the making. 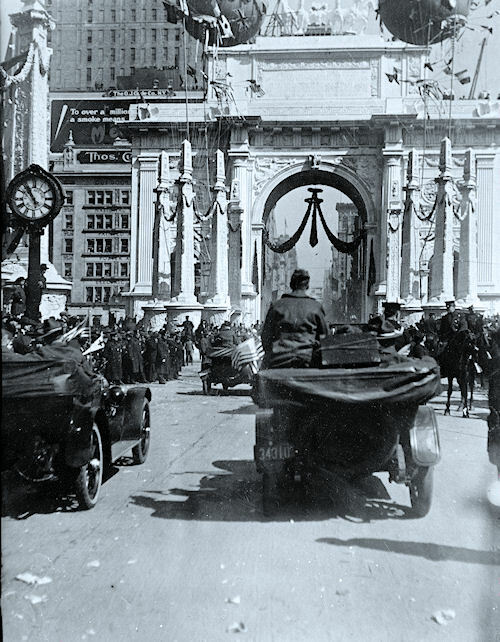 Ironically the Victory Arch was not conceived in triumph but can be traced to when the war’s outcome was still very much in doubt; planning for a Great War-related edifice dated as far back as February 1918, when most Doughboys and prospective recruits were still stateside. The project’s major stakeholders included the eminent National Sculpture Society, the Mayor’s Committee on National Defense, and the U.S. military itself, among others. These leaders envisioned a monument that might serve as a recruiting tool in those still-early days of American involvement in the war. That structure never materialized, but on November 12—the day after the Armistice—officials returned to the idea of a memorial and the project was on once again. 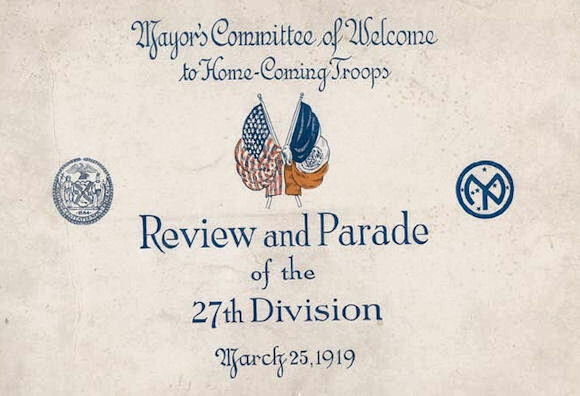 Because a Mayor’s Committee on National Defense no longer made sense once the Armistice came Mayor John Francis Hylan immediately created two new bodies: a Mayor's Committee of Welcome to Home-Coming Troops and a Mayor’s Committee on Permanent War Memorial. Hylan quickly appointed department store magnate Rodman Wanamaker chairman of both committees. As the committee titles indicate, Wanamaker and his associates had a dual mandate—first would be the homecoming welcomes for various units, followed thereafter by the creation of a permanent Great War memorial. Time was of the essence. In late 1918 and early 1919 troops were coming home by the thousands crammed aboard transatlantic ocean liners, soon to be discharged and returned to their families. Wanamaker and his associates got down to work immediately, selecting Madison Square just before Thanksgiving and by year’s end hiring Thomas Hastings to design the arch. Paul Wayland Bartlett, head of the National Sculpture Society, was to execute a chariot atop the edifice with symbolic figures representing wisdom, power, justice, and peace alongside it. Eager to take part, dozens of prominent artists and architects, including Daniel Chester French, Cass Gilbert, and Gertrude Vanderbilt Whitney participated as well, not just in Madison Square, but at sites farther up Fifth Avenue at the 42nd Street New York Library and East 60th Street adjacent to Central Park. Donations poured and volunteers rolled up their sleeves for the task. The work proceeded over the winter while troops continued their return. On one day alone—6 March 1919—over 13,500 men from the 27th Division arrived in New York Harbor aboard the Leviathan and Mauritania. The 27th—O’Ryan’s Roughnecks—was comprised primarily of men from the Empire State and their return naturally drew great excitement. Men from the 27th continued pouring in over the following days and weeks and the division’s homecoming parade was soon scheduled for 25 March. It would stretch nearly five miles from Washington Square Park up Fifth Avenue to 110th Street. 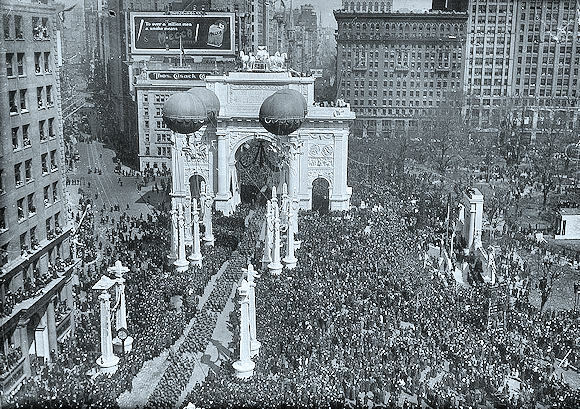 The New York Times described Fifth Avenue on the eve of the event, gleaming as it was in the flood lights of 100,000,000 candle power, as a “canyon of brilliancy.” The 27th Division parade that passed through the Madison Square Park Victory Arch that 25 March was the largest gathering in New York City up to that time. The crowd was so large and proved so unwieldy that two people were killed and over thirty wounded as attendees pushed forward to get a better look. The following day the Roughnecks were back at Camp Upton, soon to be discharged in early April and returned home. In early May the men of the 77th Division had their parade. City and military officials maintained a stronger presence for the march through the Arch of the Doughboys from the 77th “Liberty” Division. 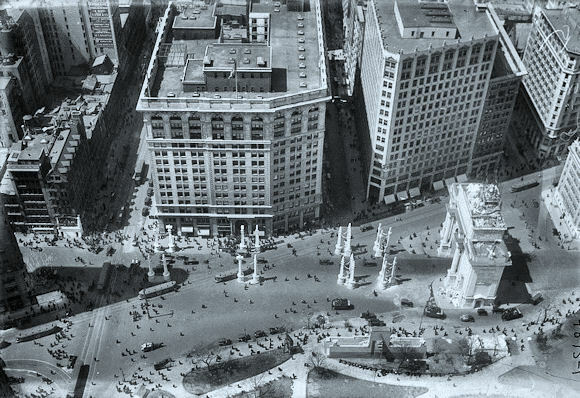 The parades and homecomings over, the Madison Square Victory Arch was demolished by summer 1920. Rodman Wanamaker and his colleagues then began their next task—building a permanent memorial. The idea of a Great War memorial for New York City continued for almost a decade and a half. Interest was initially intense but waned as the 1920s progressed and it became apparent that the war to end all wars had led only to revolution, discontent, and instability. Many were also turned off by what they saw as the various proposals’ excessive triumphalism, anti-German nativism, and excessive price tag. United States Congressman Fiorello H. La Guardia, himself a Great War veteran—a major in the U.S. Air Service stationed on the Italian-Austrian front where he ran bombing runs and worked as a translator and liaison—eventually even soured on the project. La Guardia was elected mayor of New York City in November 1933 and in January 1934 appointed Robert Moses commissioner of the New York City Parks Department. Moses believed parks should be more for exercise and recreation than commemoration and quickly set about on his mission of building playgrounds, swimming pools, and ball fields. While there are many fine World War One monuments in New York City, a permanent, large-scale Great War memorial for Gotham was not to be. Keith Muchowski, a librarian and professor at New York City College of Technology (CUNY) in Brooklyn, writes occasionally for Roads to the Great War. He blogs at thestrawfoot.com. Does anyone know what happened to the arch? The remnant of other temporary structures have been left in museums or incorporated into other buildings. Did that happen here? Tom, as you point out museums and other institutions sometimes indeed do incorporate these types of things into their buildings or collections. For instance, the Brooklyn Museum of Art maintains an outstanding sculpture garden of saved statuary and monuments. Alas however I don't believe anything was rescued from the 1919-20 Madison Square Victory Arch within any institution.